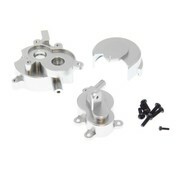 RedCat Racing (RER11401) Aluminum Transmission Case Housing Set - ExcelRC.com - Michigan's best RC store! This Aluminum Transmission Case is very well machined. It includes the Gear Cover and Screws necessary for installation.